Maya Mor Jewelry is dedicated to contemporary and avant-garde jewelry and to one-of-a-kind pieces that are personally designed and created by Maya. The jewels are handmade with skillful goldsmithing work and advanced technologies, comfortable to wear due to their ergonomic shapes and carefully finished with the passion for quality that is Maya Mor's signature. ❖ Width - 14 mm (0.5 inches). ❖ Available in sizes 4 - 10 (and all 1/4 sizes in between). 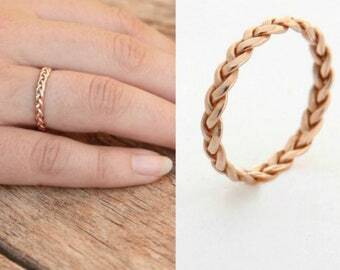 ❖ NOT SURE WHAT YOUR RING SIZE IS ? ? ? 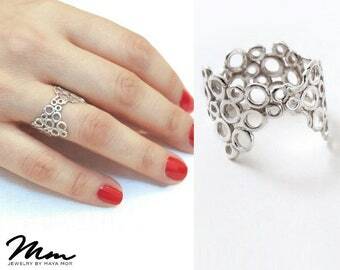 Buy the adjustable ring measure ! 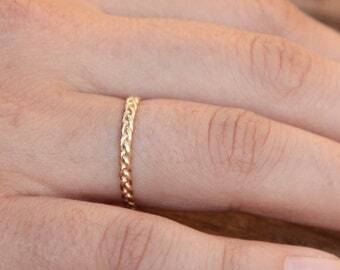 When you buy a ring the full cost of the measure will be returned to you. >PROCESSING time - Since every order is HANDMADE TO ORDER - Items ship worldwide within 14-40 business days after receiving payment. > STANDARD Shipping (registered mail) takes about 14-40 days to arrive to its destination. Rate for this service: $5. Available: Worldwide. > FAST Shipping delivery (Eco post Shipping) takes about 5-7 business days to arrive. Rate for this service: $10. Available in the following Countries: USA, Canada, Australia, UK, Belgium, Germany, Netherlands, Spain, France, Sweden and Switzerland. Eco Post Shipping is traceable in the USA. > EXPEDITED Shipping delivery takes about 3-5 business days to arrive. Rate for this service: $33. Available: Worldwide. The piece is beautiful. The seller was great at answering all of our questions, and provided helpful tracking information when the ring shipped. We love it!! The personal touches added along the course of buying this item made the entire purchasing experience even better. The item shipped on time and fit exactly as expected. Thank you, MayaMor! I absolutely love my ring! It is perfect and just as expected. Thank you! ▸ I accept payment only through PayPal which accepts all major credit cards. ▸ Remember - you don't need to open a PayPal account to use their service. ▸ YOUR FIRST TIME WITH ETSY? NEED HELP WITH CHECKOUT? ▸ Click on this link for an easy step-by-step explanation. If anything is not right please contact me and I will try to sort the problem out to the best of my ability. All refunds and exchanges are considered on a case-by-case basis. ❖ If, for any reason, you are not happy with your purchase, it can be returned within 7 days for a full refund minus shipping costs - provided it has not been worn or damaged. ❖ If you have any other problem contact me as soon as possible and I will do everything I possibly can to find a solution. ❖ If your jewelry needs renewal of plating, please send it to us and we will send it back to you free of charge. ❖ We do charge a small fee for renewals of plating after termination of 3 month warranty. Personalized orders are created especially for you and cannot be resold. Therefore in most cases there can be no refund. ❖ I do my best to give as clear a description of my pieces as possible but bear in mind that each and every piece is specially hand-crafted and therefore may have slight differences from the original photograph. ❖ In any case if you are unsure of something I am always here to answer your questions. For all queries contact me useing the blue "Contact Shop Owner" in the left hand menu. ▸ All orders are automatically shipped to your ETSY address. ▸ If you wish your purchase to be sent to a different destination please let me know. ▸ All orders ship from Israel within 14-21 working days (due to holiday season- temporarily 34 days) from the moment payment is processed. ▸ There are 4 methods of shipping to choose from. ▸ Length of shipping time varies from country to country. ▸ I'll be happy to help if you have difficulty tracking online. ▸ This is my DEFAULT option for all orders UNDER $285. ▸ Delivery time: 15 -40 working days. ▸ It is faster and OPTIONAL for all orders UNDER $285. ▸ Rates for this service: $14 dollars. ▸ Delivery time: 7-12 working days. ▸ This is my DEFAULT option for all orders OVER $285. - as it is safest and best insured. ▸ Rates for this service: $28 dollars. ▸ Delivery time: 3 - 5 working days. ▸ If you are interested in a faster but more expensive service (2-4 working days) contact me and I will check the costs for you. ▸Use the blue button "CONTACT SHOP OWNER" situated in the left hand menu. ▸ The buyer is responsible for any customs duties or taxes which may be charged upon delivery. ▸ This varies greatly from country to country so please be aware. ▸ Delivery times are only an estimate and don't account for special postal holiday delays. ♥ CUSTOM ORDERS are always welcome. ♥ I love challenges and adore creating anything new. ♥ Feel free to contact me about anything you have in mind. ♥ Use the blue button "CONTACT SHOP OWNER" situated in the left hand menu. .
All jewelry needs special care – whether it is solid gold or silver or metal plating. •	Avoid wearing jewelry whilst sleeping,working or exercising. •	Avoid contact with cleaning materials,perfumes,hair sprays and other beauty products. •	Store carefully and individually in a dry place to avoid scratches or corrosive damp. •	Clean your jewelry with a soft cotton cloth and warm water. Use a tiny drop of liquid soap if needed. 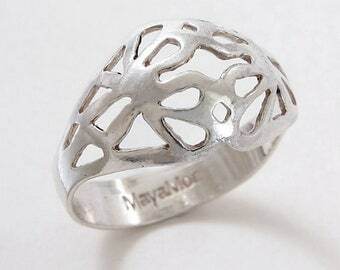 •	Do not use a jewelry cloth as it usually contains chemicals that will scrub off the surface. •	Even striking your ring on a keyboard or steering wheel can have negative effects over a long period of time. ♥ All my jewels are sent beautifully gift-wrapped in an elegant and sophisticated jewelry box, ready to be given as a gift. ♥ I will be happy to add a hand written card if it's a gift - Just send me the details. ♥ STANDARD Shipping (registered mail) takes about 10-14 days to arrive to its destination. Rate for this service: $7. Available: Worldwide. ♥ FAST Shipping (Eco post) takes about 5-7 business days to arrive. Rate for this service: $14. Available in the following Countries: USA, Canada, Austria, Belgium, Denmark, France, Germany, Ireland, Italy, Netherlands, Norway, Spain, Poland, United Kingdom, Sweden and Switzerland. Eco Post Shipping is traceable in the USA. Also available in Australia and Hong Kong - but takes about 10-12 business days to arrive to these two destinations. ♥ EXPEDITED Shipping takes about 3-5 business days to arrive. Rate for this service: $28. Available & Traceable: Worldwide. 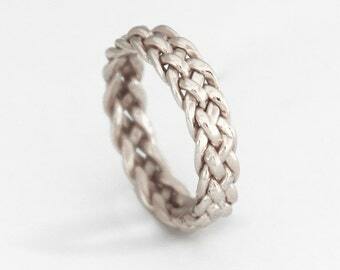 I will completely REFUND you when you purchase one of my rings. Is this jewel available in other materials? Contact me for a quote and further details. Please don't hesitate to contact me! I do my best to answer every message within 24 hour, and am always open and welcoming any suggestions, inquiries, questions or requests.